I’m pleased to announced that my 10th annual TSIA Technology Survey is now open! This survey covers 24 categories of tools and services used by customer support, professional services, education services, managed services and field service. The survey is open to everyone (not just TSIA members), and if you complete the survey, you will receive a copy of the resulting research report, “The 2015 TSIA Heatmap,” which discusses adoption levels of each category and top technology trends related to service organizations. The survey addresses adoption, satisfaction, and planned spending for commonly used technologies including CRM, knowledge management, enterprise search, web collaboration, online communities, social media monitoring, analytic platforms, learning management, etc. The survey asks which line of service you work for, then only prompts you with categories that apply. For example, if you work in Field Service, you will be asked about scheduling and dispatch tools, and if you work in Professional Services, you will be asked about professional services automation. So you won’t have to answer all 24 categories! Consumption Monitoring/Analytics: These tools are used to measure and monitor customer consumption of technology, gauging how quickly customers are adoption new tools, common process flows, top used features, number of users and length of session time, etc. Consumption Monitoring is a key piece of a Customer Success strategy. Recurring Revenue Management: These tools are used by service professional to manage the sales and renewals processes for maintenance and service contracts. Functionality includes automating renewals, renewal dashboards, and analytics to predict likelihood of renewal and manage profitable contract/maintenance programs. Upsell/Cross-Sell: Also known as offer management software, these tools prompt call center, tech support, field service, or renewal sales reps with contextual offers to extend to customers, using analytics to identify offers they are most likely to accept. Tracking extend and accept rates, the software continues to learn which offer to prompt for which situation and customer profile. I make great use of the data collected, with mulitple reports published of the survey findings for the Spring Technology Services World Conference in Santa Clara. 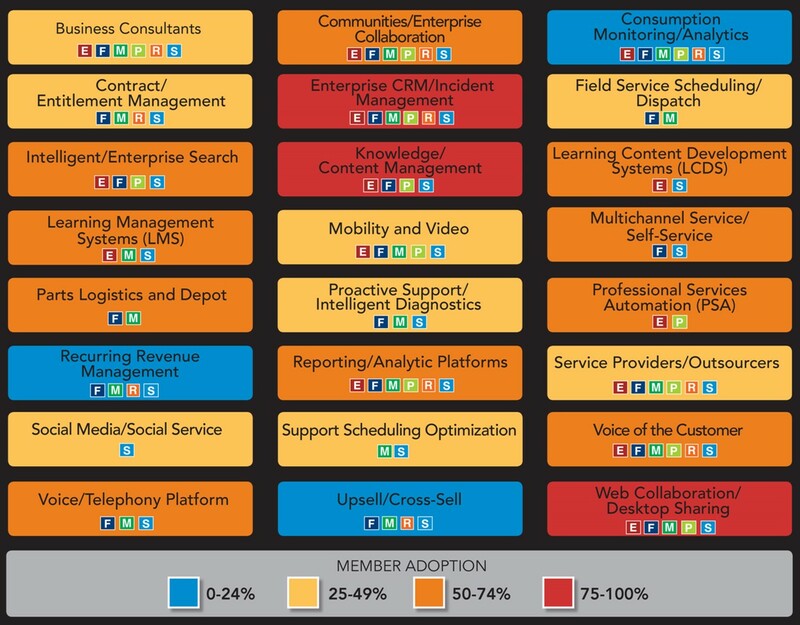 First is the 2015 Technology Heatmap, which looks at high level adoption and spending trends across service disciplines. This report will be sent to everyone who completes the survey. In addition, I will publish detailed spending report by service discipline, a separate report on EMEA, as well as the “top installed” report, listing the top used tools or service providers in each category. If you are a TSIA partner, ask your customers to take the survey! Thanks in advance for your support, and after you take the survey, pass along the link to your friends in service organizations! The more responses, the better. And as always, thanks for reading! Here we are at the holiday season once again. When I was a kid, it seemed that Thanksgiving and Christmas were always a million miles away, but as I get older, time accelerates, and it feels like I just put the tree and decorations away a few weeks ago. This week we all take some time to think about what we are thankful for, and I truly give thanks for my personal and professional existence. But I thought it would be fun to write a post about what I’m thankful for this year as a service technology analyst. Here goes! I’m thankful for new KM insights. This was the first year that I conducted TSIA’s knowledge management survey, and instead of focusing just on metrics like days to publish, I dug into KM potential, culture issues, adoption of emerging technologies, and the “rip and replace” problem. The data was very impactful, and has really informed my research and conversations. Though I cover a lot of technology topics as an analyst, I’m the most passionate about knowledge management tools and processes. It is great to have data-backed talking points about where companies struggle and pacesetter practices for success. I’m thankful for rising PSA adoption and interest. The first few years I was the technology analyst for TSIA’s new professional services practice, it was the easiest job in the world–no one asked me about anything. Boy, has that changed. Today Professional Services Automation (PSA) is my #2 or #3 topic by inquiry volume. I’m seeing PS organizations become more sophisticated in their use of technology, including automated scheduling, analytic-powered dashboards, and automated billing, and core PS metrics like utilization rates and billable utilization are rising as a result. I’m thankful for managed services. In my industry it seems almost politically incorrect to say anything negative about the cloud. But I hear from large enterprises every week who jumped on the cloud bandwagon, usually to save money on a CRM deployment, and are finding the tools are not as sophisticated or feature rich as their legacy solution, and often with abysmal usability. Managed services is rescuing this, offering the sophistication of onpremise technology with none of the ownership headaches or cost. According to George Humphrey, TSIA’s Senior Director of Managed Service Research, “It’s becoming less important to the customer where the product resides. It is becoming crucial to the customer that, whoever sells them the solution, that it is managed. It doesn’t matter if the technology provider is an SI, SP, VAR or the manufacturer selling direct. The expectation from the customer is that it is a fully managed OpEx solutions. The MSPs that are offering this type of solution are seeing explosive revenue growth in MS (many seeing triple digit growth).” For 2015, I expect to see some unhappy cloud customers moving to a managed service platform that better fits their needs. I’m thankful mobility has moved beyond trend into serious business impact. Back in my CRM days, I was the product manager for a WAP CRM product, which I don’t think anyone ever used. The WAP interfaces were so klunky they really didn’t offer huge value for field employees. Early in my Forrester career I wrote a research report about mobile CRM, calling it, “The Next Big Thing That Hasn’t Happened Yet,” because all the vendors were releasing WAP products but no one seemed to be adopting them. The latest round of mobile solutions are a huge improvement, and as a result, we are seeing wide adoption and real business benefits. 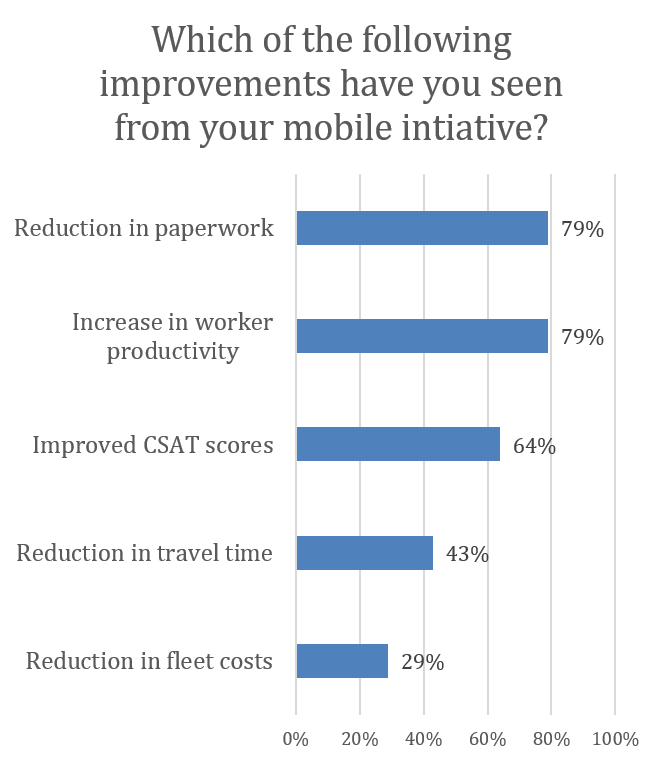 Here’s a chart with some data from our Field Service benchmark survey, which asks field service organizations what sort of business impacts they have seen from mobile initiatives. The value is clear and documentable, and I’m thrilled to see this “next big thing” is finally having the impact we all envisioned over a decade ago. I’m thankful NPS is losing some luster. I’ve gotten in trouble over the years because I have never been a fan of net promoter scores. I totally understand the importance of repeat business and referrals, but too many companies asked the “would you recommend us” question once a year, of one person at the account, which in my opinion is a totally useless way to gather real information on customer satisfaction and loyalty. Let’s be honest–many NPS programs are only designed to allow executive bonuses to pay out–not to really measure customer sentiment. Over the last 6 months I’ve heard many companies talk about how shallow their NPS program was, in retrospect. The new focus on customer consumption, customer experience, and now customer effort scores seem to be measuring much more actionable information than a single NPS score. Wishing each of you a wonderful holiday season. And as always, thanks for reading! Change is hard. No matter how long you’ve had your old system, and how much people may grumble about using it, getting employees to embrace a new system isn’t easy. The #1 complaint from employees when I do system audits is “they shoved this new system down my throat.” This is one of those times when you should over-communicate with employees. Tell them why you are making the change. Give them demos of the new system. Buy everyone a mug or t-shirt with the new vendor’s logo. Do what you can to get them informed and excited about the new system before you start training them to use it. This will go a long way towards getting acceptance and rapid adoption for the rollout. Change is good. The biggest mistake I see companies make when they migrate to a new system is just replicating the old screens and process flows on a new platform. You need to take a very hard look at your legacy implementation and figure out what’s working, and what’s not. Do a real audit of the current system so you know what NOT to recreate in the new platform. I even recommend surveying employees about what they like and don’t like in the old system, which goes a long way toward getting them invested in a new system. Typically, a lot of fields and process flows were added over the years for one reason or another, and many of them need to be eliminated. Process analysis isn’t fun, but you need to look at all your customer-facing processes and identify where changes should be made. Implementing a new CRM system is a wonderful opportunity to change what’s not working. Minimize customizations. Popular CRM systems have thousands of customers, and their “out of box” capabilities and screens reflect the most common, i.e., best practice, approaches used by their customers. Try to stay “out of box” as much as possible. If you see areas—and you will—that need major customizations to meet your current processes, ask yourself if those processes are really providing competitive differentiation for your company. Maybe going with a common industry approach is the right thing to do. The other thing to keep in mind is that the traditional OnPremise CRM platforms are fairly complex, and customizations may require a highly trained system administrator with some programming skills. In newer cloud CRM platforms, customizations are very simple to do with little training. This is both a blessing and a curse. Because customizations are so easy, companies go crazy making constant tweaks, which can wreak havoc for users and degrade usability. Make sure you have a process in place to evaluate and approve every customization before implementing it. Prioritize integrations early in the project. I’ve done a lot of writing and inquiries about integrating CRM to other systems to enable “quote to cash.” There are many 3rd party applications you should consider integrating with CRM to streamline processes and avoid employees juggling multiple applications. Knowledge management is an obvious example, with integration performing automatic searches of the knowledgebase based on incident text and field values. PSA is another example, with integration to CRM automatically passing along new project information to the PSA system to enable resource and project management. The majority of the time, companies say, “Let me just get CRM up and running, and we’ll do the integrations in Phase 2.” The problem is, Phase 2 never happens. Hopefully, you have selected a CRM platform with integrations in mind, as each CRM vendor has a set of ecosystem partners with packaged integrations to minimize the effort required. Get a realistic estimate early in the project about time/costs to integrate each 3rd party system, and try to get as many integrations as possible into the initial project phase. Pick your implementor with care. I guess this goes without saying. But I’ve heard some horror stories about really bad implementors, so be sure you carefully evaluate their credentials and check several of their references. As I said previously, implementing cloud CRM may not require as much technical/programming skills as OnPremise CRM systems. A decade ago, most CRM implementors worked with big accounting firms, and you were assigned a project team with deep experience in process optimization and certified on the CRM platform so they knew every bell and whistle in the system. Unfortunately, today I see companies hiring some yahoo whose only experience was implementing a cloud CRM system for small non-profits or a 5 person insurance office, and they have no clue about “best in class” processes or any real depth of knowledge about the platform. I know many of my readers know as much or more than I do on this topic, so please submit comments with any other suggestions you may have on what to do–or what to avoid doing–to make moving to a new CRM system successful. Thanks for reading! Yesterday was opening day of Technology Services World Best Practices, and I had a very full day. I did 5 presentations, which I think is a new personal record for a single day. The day started with the TechFUTURES event, which was hugely attended, then the TechBEST showcase. I gave a tech trends overview at the partner Expo kickoff, then had my power hour session, and finally moderated a session on social support. As you can see, the categories are color coded by adoption level, with letters indicating which service disciplines each category applies to (E=Education Services, F=Field Service, M=Managed Services, P=Professional Services, R=Service Revenue Generation, S=Support Services). For more details on adoption and spending trends, see the spending reports for each discipline live now on TSIA.com. Thanks for reading, and hope to see you this week at TSW! Our big spring event, Technology Services World Best Practices, kicks off next week at the Santa Clara Convention Center. The conference begins for me on Sunday with partner advisory board and internal meetings, then we officially open the doors on Monday. I’ve been getting emails asking what I’ll be doing at the conference and where to find me, so wanted to give everyone a look at what I’ll be up to at TSW. Here’s a link to the full conference schedule. Monday 11am-12:30pm. TechFUTURES: The Future of Service Technology. This is the opening event at the conference, and I’m really looking forward to it. I will take the audience 5 years in the future for a look at the impacts of Extreme Efficiency and Extreme Automation, focusing on 3 areas: Analytics, Collaboration, and Service Channels. We will have 3 presenters, from Changepoint, Jive Software and Support.com, each painting their view of 2019. Then the audience votes for who gives the most provocative view of the future. Don’t miss this fun event! Monday 12:45-1:45pm. TechBEST Showcase. My annual global technology survey covers 24 categories of tools and services, with dozens of vendors/providers in each category. One of the things I survey about is satisfaction, and in general, the numbers aren’t that great. However, there are some bright spots with companies receiving extremely high scores. The 3 TSIA partners with the highest satisfaction scores are finalists for the 2014 TechBEST Best in Satisfaction Award. In this showcase, I will unveil the finalists and interview them about how they are able to have such satisfied customers. Monday 3-4pm, Power Hour: The 2014 TSIA Technology Heatmap. In this session, I will reveal the results of my 2014 Global Technology Survey, including adoption, satisfaction and planned spending across 24 categories of tools and services, including analytics, CRM, online communities, web collaboration, PSA, and more. I will also touch on the top technology and social trends I’m seeing. Monday 4:15-5:15, Pacesetter Practices: Social Media for Support. In this session I will talk about the results of my recent Social Media in Support survey, then turn things over to two experts on social support: Doug Pluta, Project Manager, Cisco; and Tim Lopez, Social Media Manager, Symantec. We will talk about the importance of social media both for customer interactions, but also monitoring social conversations as part of a larger voice of the customer strategy. Tuesday 9:45-10:45am. Workout Panel: Key Criteria for Selecting a PSA Solution. Professional Services Automation (PSA) is now one of my top inquiry areas, with PS teams shopping for automation around resource management, project management, and project accounting. I will be moderating a panel of experts on the topic: Al Gray – Vice President, Bentley Systems; Keith Drab – Solutions Architect, Changepoint; and Jeff Gebhart – Senior Solutions Consultant, Planview. A prize will be given for the best audience question, so be sure to attend and participate! Wednesday 11am-12:30pm, Service Revolutions. This is our annual “American Idol” contest for cool technology, with presentations from startups, established tech firms, and some TSIA members, on innovative technologies for streamlining and automating service delivery. I will be doing my best Paul Abdul on the panel of experts, providing pithy comments after each presentation. Live audience voting determines the winners. I still have a few slots left for 1:1 meetings on Tuesday, so see Susie at the registration desk to book a time to discuss your service technology challenges, or to find out the best Mexican place close to the conference center. Thanks for reading, and see you next week! Large enterprises embrace cloud applications. Small and medium-sized businesses were early adopters of cloud applications, and as many OnDemand suites are much less sophisticated than their OnPremise counterparts, the lighter-weight tools met the needs of SMBs just fine. But this year I’ve talked to service executives of some the largest tech companies in North America and Europe who were in the midst of a migration from a legacy CRM system to a lower cost cloud suite. As I’ve written about before, large companies moving to cloud tools have to streamline and consolidate processes as the applications don’t support heavy customization. Unfortunately, about 3 months after the move to the cloud, I start getting calls asking about functional gaps they did not anticipate. Your cloud CRM tools probably do not include support for complex entitlement, automating renewals, or knowledge management beyond a list of solutions. With the move to the cloud all but inevitable, there is some heavy lifting that must be done to achieve extreme efficiency with the new technologies. Knowledge management evolves beyond support. I first published a report back in 2009 about knowledge management being a cross-discipline (support services, field service, education services, professional services, managed services) subject, with convergence needed to leverage existing tools and processes across the enterprise. But it wasn’t until this year that I started receiving numerous KM inquiries outside of support. PS asking for best practices to capture and share lessons learned across project teams. Field service wanting to know how to best leverage mobile tools to access corporate knowledge from the field. Education services interested in how to define KM roles, as demand shifts from teacher to librarian. And, as I heard at our recent Las Vegas conference, support may have their KM practices well-defined, but other groups see support’s approach too slow, too complicated and too focused on experts instead of collaboration. I think what we consider “KM best practices” is going to radically shift, and I also expect to see more Knowledge as a Service (which I’m going to call KaaS) providers entering the market. Too many companies have re-implemented KM tools and jump-started KM practices every 3-4 years for the last 12 years, maybe it is time to try a new approach? Professional Services Automation (PSA) is the new MUST HAVE application category. I’ve always joked that professional services teams were too busy implementing technology for their customers to ever use any for themselves. PSA, which includes modules for resource management, project management and project accounting, is still not that highly adopted (according to my 2013 Member Technology Survey, 58% of PS members are using PSA). But, spending is on the rise, with over half of PS members (54%) having budget for new or additional PSA in 2013-2014. And as a proof point, my inquiries on PSA have risen to become my third hottest topic, after CRM and KM. I just published a new report, Five Key Criteria in Making a PSA Decision, based on dozens of these conversations over the last year. If you are still managing your PS operation using spreadsheets, now’s the time to make a change. Video in Service: Here to stay. A couple of years ago I gave a conference presentation about the future of video in service, and received more than a few snarky comments saying it would never happen. Never mind that even then, Salesforce.com was using video chat tools with premiere customers, and the use cases for incorporating video into trouble shooting were many and varied. But video in service suddenly became a very hot topic recently when Amazon released the Kindle Fire HDX, and featured a video chat option, called the “Mayday button“, in print and TV advertising. The ads show a customer linking to a live video chat agent for help, with the agent able to take control of your device and even write on the tablet to illustrate how to do something. Remote control of mobile devices isn’t new (checkout LogMeIn and Bomgar), but seeing it used along with video chat introduced a whole new user experience. That one commercial is going to convince consumers this is an option they need, so get ready for your closeup, Mr. DeMille. “Core” is shrinking fast. I’ve written before about how service is constantly re-evaluating core verses context, realizing that less and less of corporate operations really are key to their success. Even outsourcing technical support was a bitter bill for many B2B companies to swallow, though I’ve talked to many who now realize they should have looked to partners for assistance a decade ago. But over the last year, with more companies trying to boost revenues and cut costs in the face of all the realities described in B4B, I’m seeing more and more options on the table for outsourcing. First it was technical support level 1, then level 2/3, field service, and now maintenance renewals, managed services, social media, online community management–there are no more sacred cows. As I alluded to earlier, I’m predicting 2014 is the year Knowledge as a Service emerges as a viable approach for more companies. Over the next few weeks I’ll be thinking about how these hot topics will drive trends for 2014, and you can expect to see some of these ideas again when I publish my “state of the industry” reports in Q1. Stay tuned. And as always, thanks for reading! There is a story in my book, Lessons Unlearned, about a speech Larry Ellison gave at Oracle OpenWorld in New Orleans in 2001. Oracle was pushing big time into the enterprise applications space with their new CRM offering, and Larry was talking about ‘out of box’ verses customization. To the chagrin of the audience, he said something along the lines of, “Oracle matches your business processes 80% out of box, and you should consider changing your processes to fit ours for the other 20%.” Larry was right of course, though I didn’t necessarily realize it at the time. In fact, if I were to characterize the first “wave” of CRM, from around 1997 to 2007, I’d say it was “spend millions of dollars on complex software, and then customize the hell out of it because it wasn’t complex enough.” Large companies had CRM projects going on for years, customizing field names, screens, process flows, etc., until the product was practically unusable with dozens…if not hundreds…of required fields, pop up screens and non-intuitive flows. This of course frustrated the heck out of CRM vendors, who built those vertical-specific screens and processes using ‘best of breed’ process flows from real companies. I was involved in many CRM implementations during my vendor days, and I have audited many CRM implementations during my analyst days, and usually what I find is consistent: companies were so convinced they were unique that they took packaged applications and rewrote them until they were unusable Then they started shopping for another CRM platform, and started the process all over again. Let me be clear: when it comes to CRM, the more customizations, the less successful the implementation. I have seen this over and over and over again, and unfortunately, I still see it happening today. But luckily, a new dynamic is emerging. Over the last year I’ve seen some of the largest companies in the world decide to implement OnDemand CRM. They recognize that the new cloud platform is far less sophisticated than their existing system and processes, but these companies are on a mission from god to simplify their operations and try to use Salesforce.com–or whatever cloud solution–as ‘out of box’ as possible. This is an unbelievable shift, and definitely a shift for the better. I like to think TSIA has a hand in this shift, because through our benchmarking programs, we show companies that their peers are struggling with the identical challenges, and best practices identified by one company are wholly repeatable within another company. In other words, tech companies are more alike than they are different. With tightening budgets, shrinking margins, and unstable revenue streams, companies no longer have the luxury of repeating or prolonging mistakes with technology projects. They need to streamline and automate, and they need to do it fast. If that means swallowing your hubris and accepting the Salesforce approach to a process instead of your own, so be it. Those changes are HARD to make, especially for large firms, but I’m seeing it happen. This is great new for CRM, and for the rest of enterprise applications as well. I predict that CRM success will become more common, and the usual failure statistics for CRM (50% or higher of CRM projects don’t meet expectations) will begin to fade. Bottom line: if your CRM implementation takes more than 6 months, you are doing it wrong. Once you remove ego from the equation, you will find those out of box processes are well designed. If you identify an internal process that is radically different from the packaged application, don’t assume your way is better–I’m almost positive it isn’t. If in doubt, talk to the vendor’s product management team about why the process is designed the way it is, and go back to the drawing board and do a real assessment on your approach vs. the industry best practice. And be ready to change. We are all in this together. Let’s learn from each other, leverage our successes industry wide, and do our best to stamp out over-customization. And thanks as always for reading!